Homeopathy is growing and evolving at enormous speed. Due to the increased interest in the seventies, the booming of schools and practices, and the introduction of the computer, every aspect of homeopathy knew an enormous expansion. Studying homeopathy 30 years ago and now is a whole different thing! Time for a training adjusted and adapted to the present times. 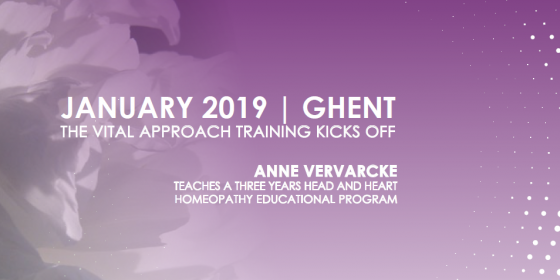 Therefore I happily announce the opening of an up-to-date, brand-new homeopathic training: shorter, more insight, less memorizing and very homeopathic: minimal dose with maximum result! Please read the full program here. When: Start of the program: 2019. Teachings from Friday 14.00 until Sunday 14.30. Dates: 11-13/1, 8-10/2, 17-19/5, 6-8/9, and 15-17/11. Price: Year One: 1650 euro. Early birds inscription before November the 15th: 1500 euro. This includes the teaching and the coffee, tea, fruit and snacks in the breaks. A full detailed program will be sent. Students who already have a basic training in homeopathy can already sign up for the second year starting in 2020. Accommodation: aanaajaanaa has a double and a triple room available in the house and can help you with booking a private room in the vicinity. There is a nice monastery in walking distance renting rooms, besides many more options in the city center. Special arrangement for our students: bed and breakfast and full board in aanaajaanaa: 185 euro for Friday and Saturday night per person in double/triple accomodation with bathroom ensuite. For nonresidents 110 euro (including breakfast in aanaajaanaa). All meals are fresh, organic and vegan. If there are special wishes for gluten free or other requests: please, tell Marcus and Carol.